(Nanowerk News) Nuclei are complex, well-defined organelles carrying genetic information that is critical to the cell. Visualizing these organelles through fluorescence imaging techniques promises to reveal the mechanisms that govern genetic information and provide ways to predict and treat genetic diseases. Working closely with Xinhai Zhang at the A*STAR Institute of Materials Research and Engineering, a research team led by Bin Liu at the National University of Singapore has now developed a method to create ultrasmall, highly selective fluorescent nanoprobes for a cellular nucleus imaging technique known as two-photon excited fluorescence (TPEF) microscopy ("Conjugated oligoelectrolyte harnessed polyhedral oligomeric silsesquioxane as light-up hybrid nanodot for two-photon fluorescence imaging of cellular nucleus"). Researchers have proposed a number of fluorescent substances to illuminate nuclei within cells. However, light-induced phenomena, such as cellular autofluorescence and severe photodamage, tend to degrade the performance of these probes. 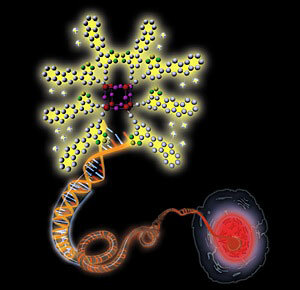 Schematic illustration showing a positively charged nanoprobe (upper left) binding to a negatively charged double-strand DNA molecule (center), resulting in enhanced fluorescence that allows the visualization of a cellular nucleus (bottom right). In the TPEF technique, each nanoprobe produces a fluorescent signal by absorbing not one but two low-energy photons of near-infrared light. This two-photon process significantly reduces the effects of photodamage and cellular autofluorescence while enhancing resolution, making TPEF advantageous over traditional one-photon fluorescence microscopy. "TPEF imaging is more powerful than one-photon imaging, in particular for in vivo and tissue imaging where strong biological autofluorescence exists," say Zhang. Instead of a traditional step-by-step synthesis, the researchers adopted a 'bottom-up' approach to synthesize the nanoprobes for their TPEF scheme. These nanoprobes consist of tiny inorganic silicon–oxygen cages surrounded by short positively charged polymer chains. The team obtained cages and chains separately before joining them together, and the synthesis lends itself well to producing TPEF nanoprobes with various light-emission colors and bio-recognition capabilities. The small, rigid cages facilitate the incorporation of the probes into cellular nuclei, while the positively charged and light-sensitive chains contribute to water-solubility and optical properties. According to Liu, these features combine to ultimately produce TPEF-suitable light-up probes. The team discovered that the fluorescence of the probes became substantially more intense upon exposure to nucleic acids, such as double-strand DNA and RNA. This is because the positively charged probes bind tightly to the negatively charged nucleic acids through attractive electrostatic interactions, increasing the micro-environmental hydrophobicity of the probes and their fluorescence. Furthermore, the probes selectively stained the nuclei of breast cancer and healthy cells with low toxicity. The researchers are currently expanding their probe collection to include other intracellular target applications. They are also further optimizing the TPEF performance of the probes. "These nanoprobes can open up new ways of interrogating biological systems in a high-contrast and safe fashion," say Zhang.